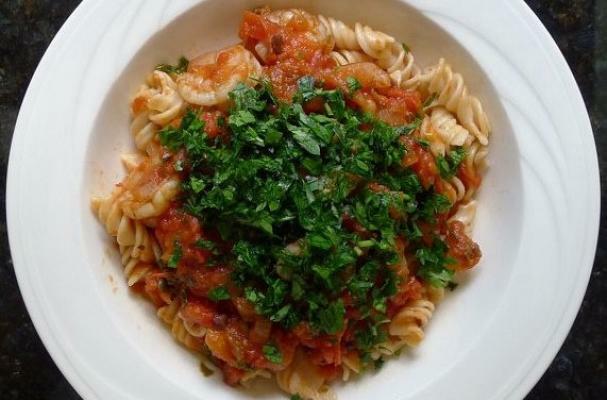 Linguine with vodka sauce and shrimp is a recipe straight from the popular television show, Mad Men. Linguine pasta is tossed is a creamy tomato sauce that is spiked with a tad of vodka. Sauteed shrimp and chunks of green asparagus are tossed in the mix to make one delicious meal. Linguine with vodaka sauce and shrimp is an easy meal that you can whip up on Sunday night right before the show starts. While pasta water comes to a boil, sauté garlic and red pepper flakes in butter. Add tomatoes and simmer for ten minutes. Stir in ricotta cheese and cream into tomatoes. Cook 2 minutes, then add asparagus and basil. Serve on cooked and drained linguine. Garnish with more fresh basil, cheese and black pepper to taste.